Just Starting Out in Life? Becoming an independent adult should be a wonderful rite of passage, something to look forward to and feel good about – and it can be if you've planned and prepared. 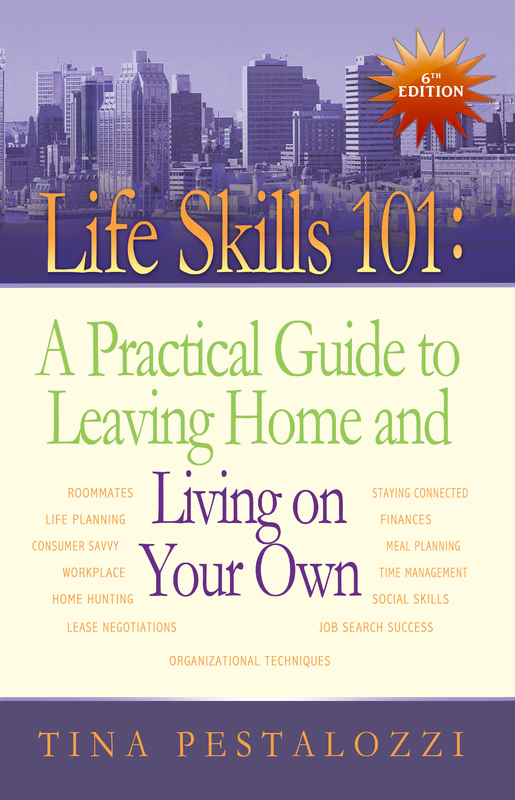 Life Skills 101: A Practical Guide to Leaving Home and Living on Your Own can help you do just that. Whether “just starting out” in life means going off to college, moving in with roommates or “renting” from your parents, the more life-sustaining skills you have, the easier your life is. The better you can maneuver in your world, the better you can perform and enjoy life to its fullest. What a wonderful and liberating experience it is to know that we really do know what we’re doing ... at least in some areas of our lives! Before leaving the parental home to strike out on your own, the most effectively beneficial preparation you can make is to give Tina Pestalozzi's Life Skills 101:... a careful reading from first page to last. Each chapter covers a major area in life skills without becoming a lecture or sounding like the proverbial parental talk. ...a one-stop shop for practical and effective ways to make the most of this young adult rite of passage. Or please ask for Life Skills 101: A Practical Guide to Leaving Home and Living on Your Own at your local library or favorite bookstore. Teaching Life Skills? Life Skills 101:... is an easy-to-understand life skills curriculum.